Second artificial satellite during final preparations for launch. "All traditions developed in rocket technology were thrown out (during work on the second satellite)," wrote Boris Chertok, deputy to Sergei Korolev. "The second satellite was created without preliminary design, or any kind of design." 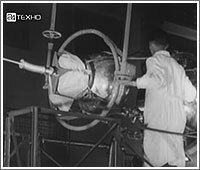 According to Chertok's memoirs, most elements of the spacecraft were manufactured from sketches, while engineers moved into production facilities to assist workers on site. (62) Only three elements of the satellite had been built with the use of blueprints. Both, a mockup and a flight version of the satellite had been built in parallel. After a series of rocket engine tests, aimed to select the powerplants with highest performance characteristics, the rocket intended to carry Sputnik-2 was shipped to Baikonur on October 19, 1957. (248) (Oct. 18, according to another source (262) The rocket arrived to Baikonur on October 22. (51) It was followed by key pieces of the satellite itself: the truss, dog's cabin, and a mockup of the satellite. In the meantime, back at the OKB-1 plant in Podlipki, engineers practiced integration of the rocket, cabin and the support truss. 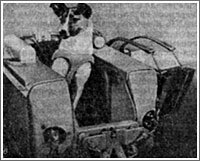 A brand-new Tupolev-104 jet aircraft was chartered to transport dogs and key personnel, participating in the mission. Due to limitations of the existing runway in Tyuratam, the aircraft would head to Tashkent, from where a smaller Ilyushin-14 propeller plane would carry people and animals to the launch site. Even the runway in Tashkent thought to be dangerously short for jet aircraft, prompting Korolev to remind a pilot that he was carrying creme-de-la-creme of the Soviet science and should be extremely careful. (262) Training of dogs continued upon arrival to Tyuratam. 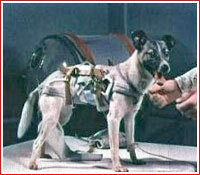 Each dog would be placed into the cabin for several hours at a time to get used to the feeding system. 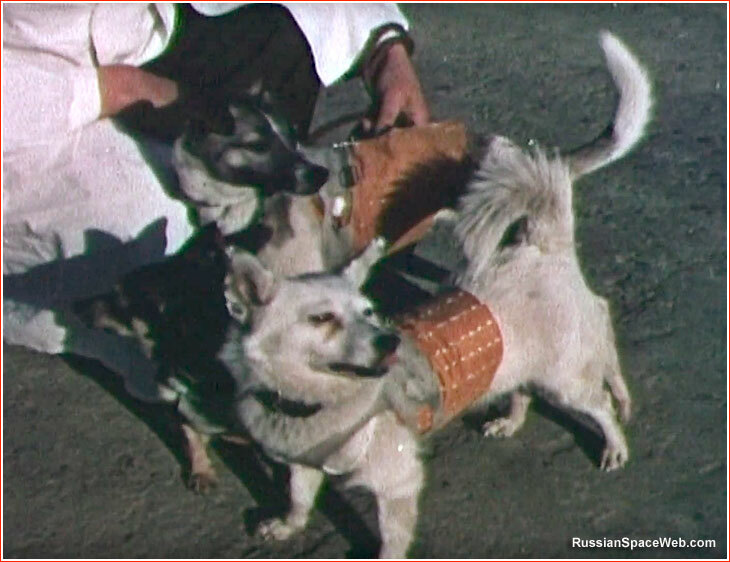 Laika and her backups during final preparations for launch of the second artificial satellite, probably at Site 2 in Tyuratam. 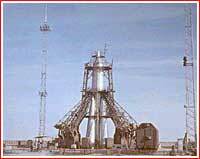 On October 26, 1957, three weeks after the Sputnik-1's triumph, Korolev departed for Tyuratam, via Tashkent. On October 31, the official note was sent to the Central Committee that the flight preparations had entered a final stage and the launch vehicle with the satellite would be rolled out to the pad during the night to November 1. With around three days required for preparations on the launch pad, the liftoff was promised on November 3 or November 4. 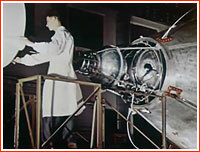 Shortly before the rollout of the rocket with Sputnik-2 to the launch pad, Leonid Voskresenky, who led pre-launch testing of the vehicle, discovered a potentially fatal problem in the flight control system. In order to stop transmission of telemetry from Sputnik-2, while it is out of range, an engineer Boris Shumakov designed a special electric circuit. The device was intended to convert the output from a timer developed by Kuznetsov to a switching signal compatible with the Tral telemetry system. If it worked correctly, it would limit the telemetry downlinks roughly to 15 minutes for each 90-minute orbit. Although Voskresensky expressed confidence in the reliability of the circuit, he did make sure that the device had been installed and activated on the rocket during system-level testing. To his and Shumakov's horror, the circuit activated the telemetry system, then switched it off, and then never switched it on again. During the mission it would mean that ground control would receive data only during the first orbit, after which the satellite would never call home again. Shumakov quickly found the problem and proposed a solution, which was implemented at earnest. The system was then tested again, demonstrating nominal performance during three 90-minute cycles. Since it was very late in the pre-launch processing, Shumakov had to climb the rocket already resting on its movable erector to do re-wiring of his circuit. Once he was done, he was careless enough to jump from the erector onto the concrete floor five meters below, instead of "wasting time," walking down the narrow stairs. As a result, he hurt his feet and could not walk normally for some half an hour. 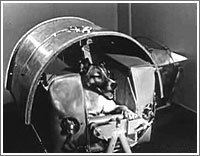 In the middle of the day before launch, Laika was placed into its holding container and it was lifted to the top of the rocket around one hour after midnight on November 3, 1957. It was a cold night, and while personnel was finalizing launch preparations, technicians extended a hose from the ground air-conditioning unit toward the cabin to warm up the dog. The transmitter and scientific instrument section is being mounted on top of the dog cabin. 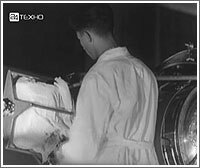 Protective clothing is being removed from the scientific instruments of the second satellite during pre-launch processing.